It is important to work the dough as little as possible—work quickly and knead and fold the dough only the number of times called for. The butter should be frozen solid before grating. In hot or humid environments, chill the flour mixture and work bowls before use. While the recipe calls for 2 whole sticks of butter, only 10 tablespoons are actually used (see step 1). If fresh berries are unavailable, an equal amount of frozen berries (do not defrost) can be substituted. An equal amount of raspberries, blackberries, or strawberries can be used in place of the blueberries. Cut larger berries into 1/4- to 1/2-inch pieces before incorporating. 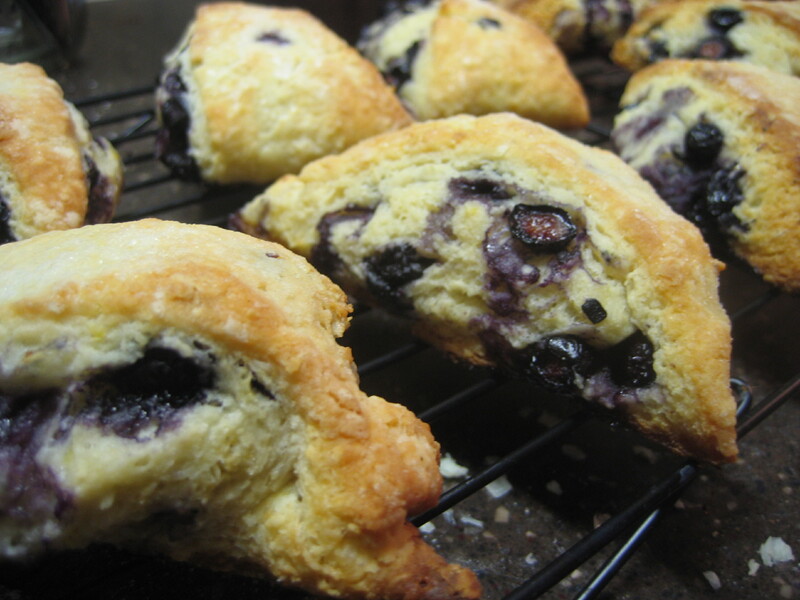 Refrigerate or freeze leftover scones, wrapped in foil, in an airtight container. To serve, remove foil and place scones on a baking sheet in a 375-degree oven. Heat until warmed through and recrisped, 8 to 10 minutes if refrigerated, 16 to 20 minutes if frozen. 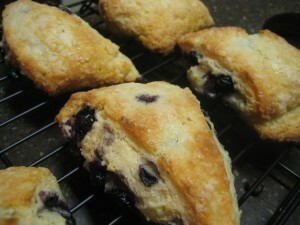 See final step for information on making the scone dough in advance. Use the wrapper to hold the frozen butter while grating it on the large holes of a box grater. Grate 4 tablespoons from each stick of butter. How could you not love these? Inside a crispy crust are buttery layers enfolding juicy blueberries that pop in your mouth like fireworks. I don’t think I’ve ever worked with a more helpful recipe. It felt like having a pastry chef with me in the kitchen.